I admit it. I judge my books by their covers...or at least I do when choosing the ones to place on top of cocktail and side tables. Why waste precious real estate with a banal book cover? But what about titles? Have you ever thought to display books with witty or naughty titles? 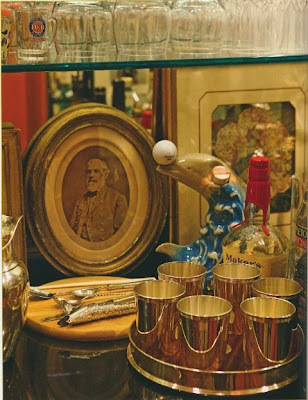 I admit that I never thought of doing so until I saw the above photo of London designer Richard Adams' bookcase. He very cleverly placed Snobs , Unsuitable Company , and Shocking! facing out on the ends of the glass shelves. I do have Shocking! in my home, and I really should place it on the top of a stack of books. Unfortunately, that might be the most Shocking! thing my home as seen. After a quick search on the web, I found all kinds of books that would be perfect to display in a woman's home. 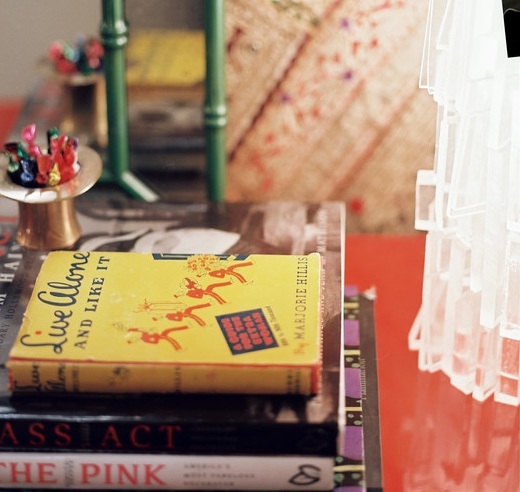 This Lonny photograph shows a stack of books in the home of New York designer Elizabeth Bauer. On top is the classic 1930s single gal primer Live Alone and Like It by Marjorie Hillis. I might have to get a copy for myself because I live alone, and guess what? I actually like it. 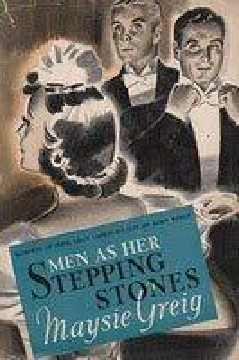 You could really be devilish and feature Maysie Greig's Men as Her Stepping Stones prominently in your home. (I have Nick Harvill to thank for introducing me to this book.) No, I'm not trying to make a statement nor a confession with this choice. The feminist counterpoint to Greig's book might be Self Made Woman by Faith Baldwin. 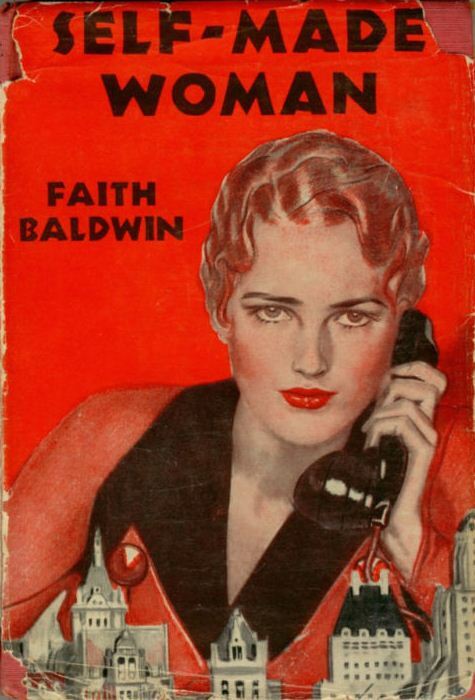 It might not be feminist, though, depending on how that woman became self made. 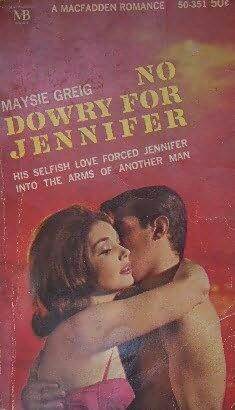 And last but not least, another Maysie Greig novel that is perfect for me: No Dowry for Jennifer. "His selfish love forced Jennifer into the arms of another man." And you thought all I did was write this blog! 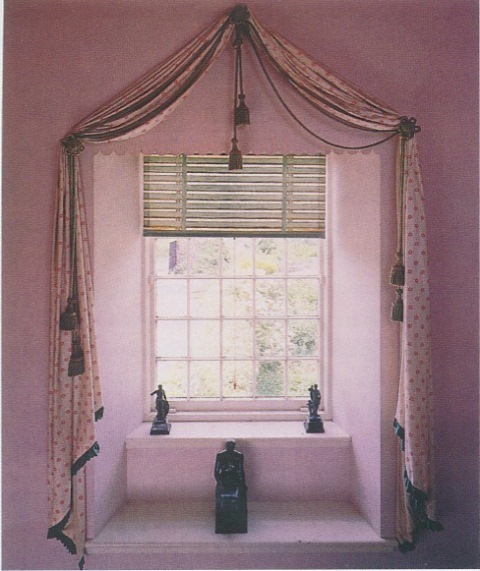 Adams photo from English Eccentric Interiors by Miranda Harrison. Bauer photo from Lonny magazine, June/July 2010, Patrick Cline photographer. Look at that glorious hallway above and tell me if it doesn't have Dorothy Draper's name written all over it. That at least was my immediate thought when I first saw this photo. In fact, old Dorothy had nothing to do with the design of this early 1960s Parisian hallway, although who knows, maybe her work inspired it. That dramatic looking surround with the columns, broken pediment, and urn scream her name to me as does that checkerboard floor. And that paneled door looks like something straight out of The Carlyle. 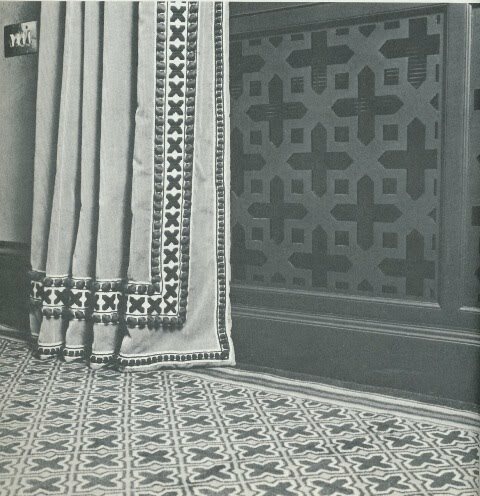 I believe that you could easily duplicate this look by using architectural stencils from Stencil Library and painting columns and such around a door surround. 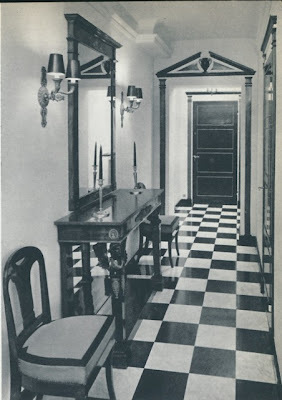 Anyway, this hall and entryway is exactly the way mine looks in my Manhattan apartment. 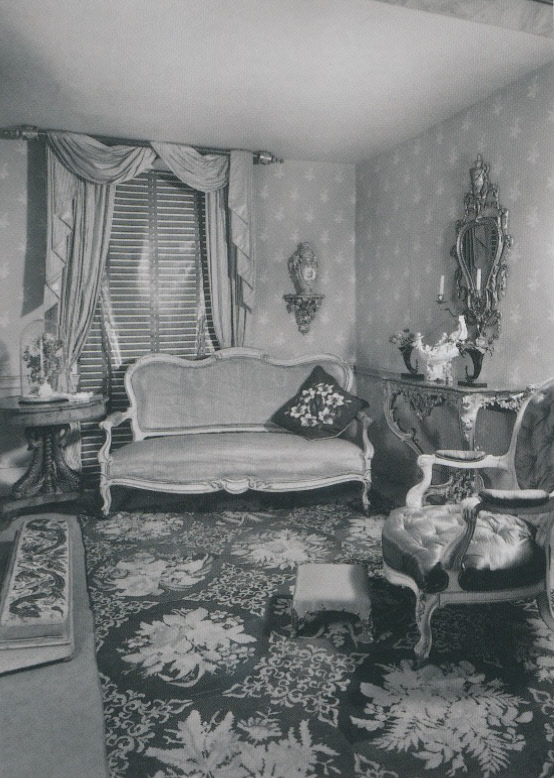 You know, the Manhattan apartment in my imagination. So, a plaid hallway might be hard to pull off unless you're Tartanscot; he makes you want to swathe and swaddle everything with the stuff. 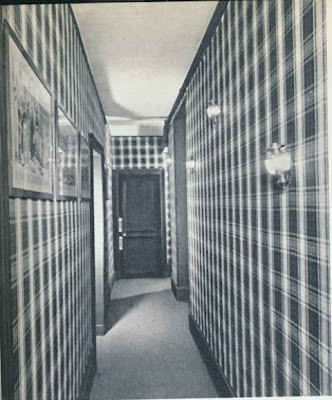 Still, how cozy would a hallway be lined in wool plaid, especially in colder climes? Oh, you know who else this hallway might be perfect for? Robert Rufino. He's also a master at decorating with plaids, tartans, and other menswear fabrics. Now this hallway is very me. 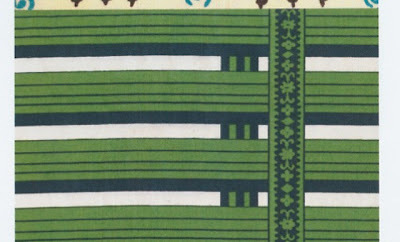 Nice striped fabric. 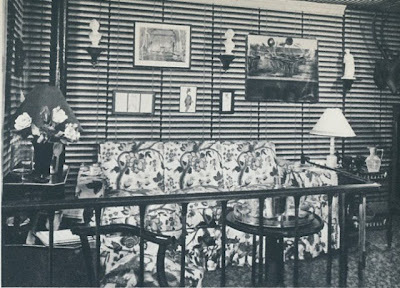 A portière framing the opening. 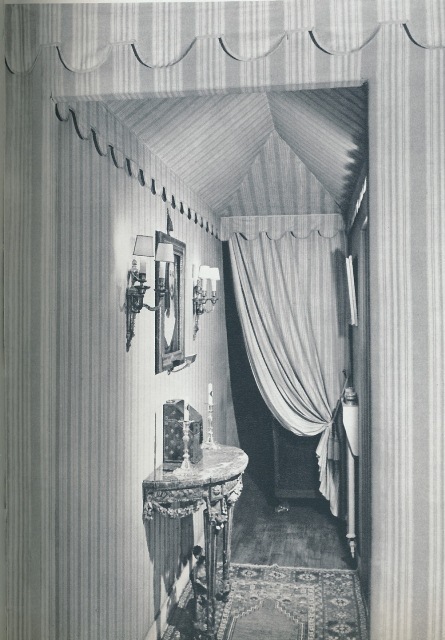 And most importantly, that tented ceiling with the scalloped edging. Glorious! This is definitely not a DIY project, although something tells me that Nick Olsen could upholster a tented room in one weekend. 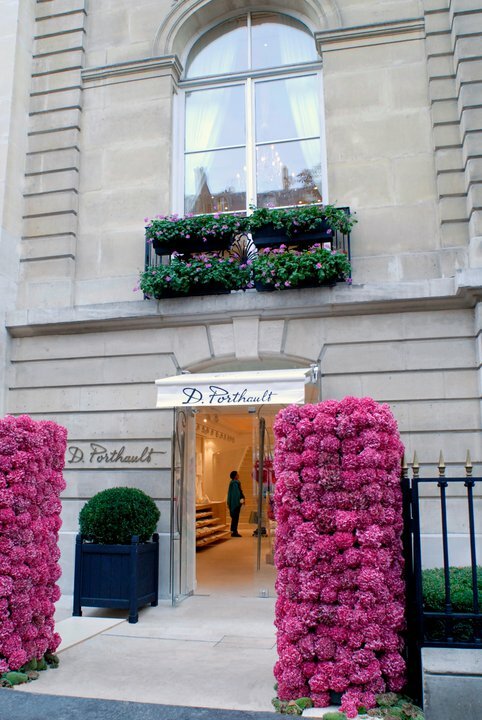 But just think about how a small entryway or vestibule could be completely transformed into something quite magical. I've always thought that trompe l'oeil hallways, entryways, bars, and alcoves are quite chic. 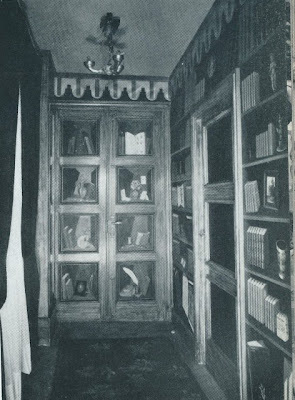 This photo shows some serious trompe l'oeil for a serious house. 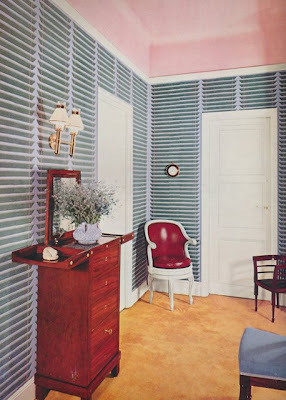 For the rest of us, trompe l'oeil wallpaper might be the way to go. 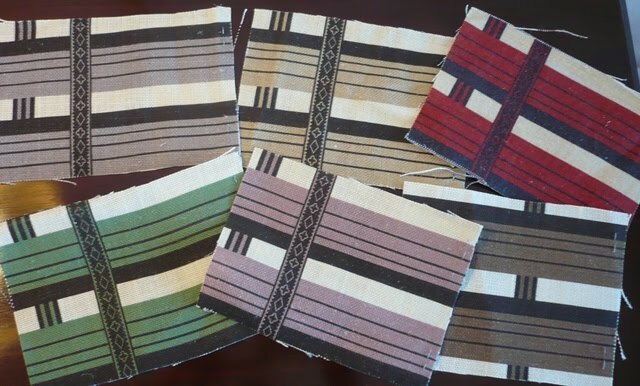 Remember my post from a few weeks back in which I featured these fetching corduroy curtains designed by Billy McCarty, the late designer who at one time worked for David Hicks? Well, Ashley Hicks was kind enough to comment on the post, writing that the curtains' borders have been reincarnated in some of Hicks' recent work. 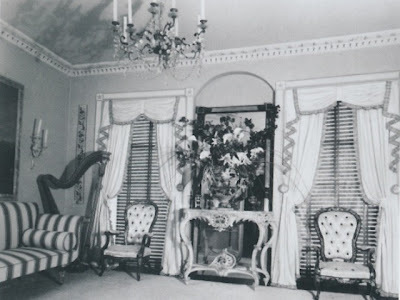 The curtains were to be thrown out by the new owners of the home seen above, but fortunately their decorator gave them a stay of execution and decided to keep them. 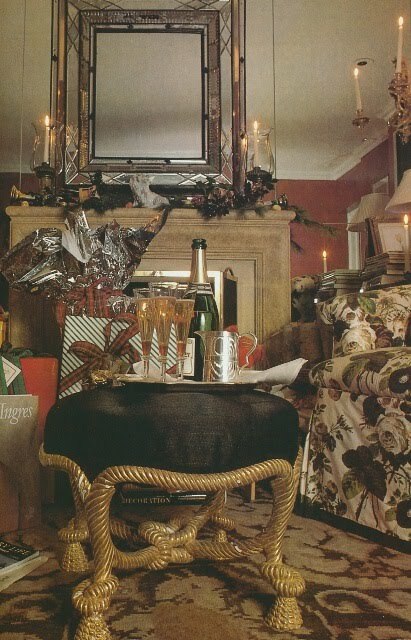 She was kind enough to later give them to Ashley Hicks, who has used the trim on his "Lonely Guy" sofa and in his London bedroom. I recently read the Hicks article in the latest issue of World of Interiors, and I never made the connection between the decoration on the sofa and the McCarty designed curtains above. What a great way to recycle those curtains, don't you think? 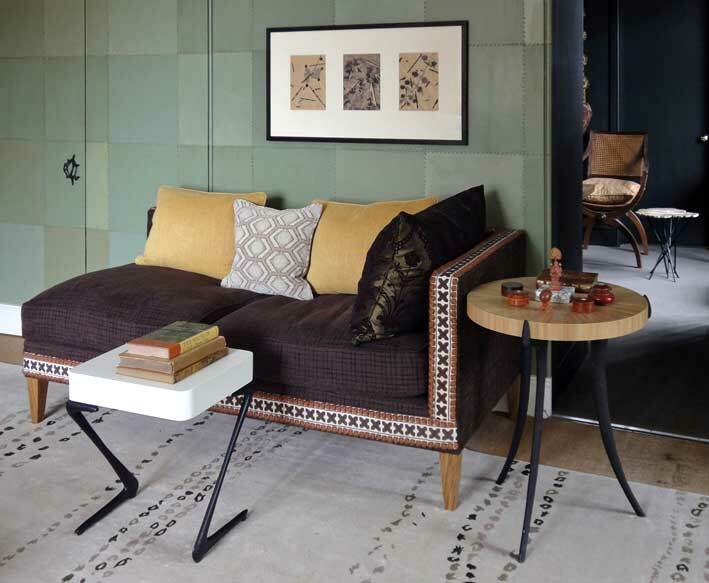 Simon Upton's photo from the January World of Interiors shows a different view of the sofa and trim. 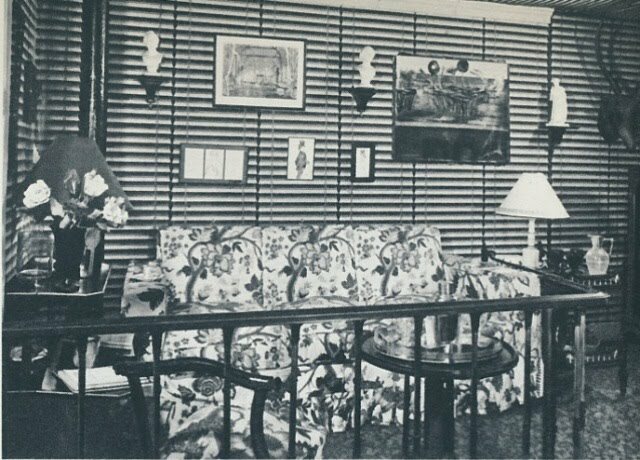 One of my all-time favorite fabrics is Venetian Blind, a trompe l'oeil chintz designed by the late, great John Fowler (see it above.) 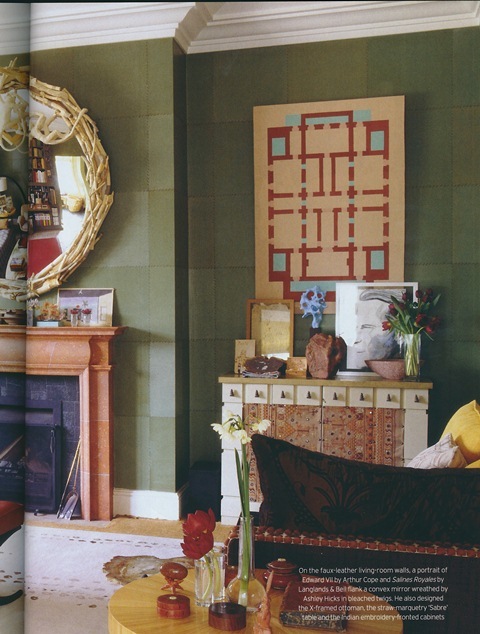 If you've read Martin Wood's book John Fowler: Prince of Decorators , you've seen the print; it makes appearances throughout the book as Fowler used it quite often in his projects. I've always wanted to make shades out of Venetian Blind ever since I saw Clarence House's version many years ago. 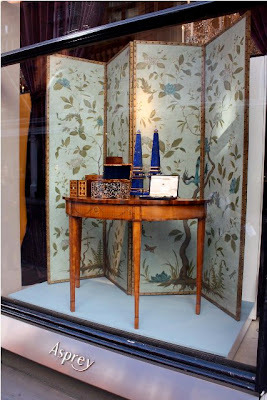 Alas, Colefax & Fowler discontinued Fowler's original print years ago, and Clarence House's version is, yes, discontinued too. I think that's why Nicky Haslam's version was met with great fanfare when it was introduced last year. Funny enough, on the same day that I received the samples, I happened to find a photo of a room designed by Madeleine Castaing in which the wallpaper looked Venetian blind-esque. It may not be a blind print per se, but you can see below that it somewhat resembles blinds. 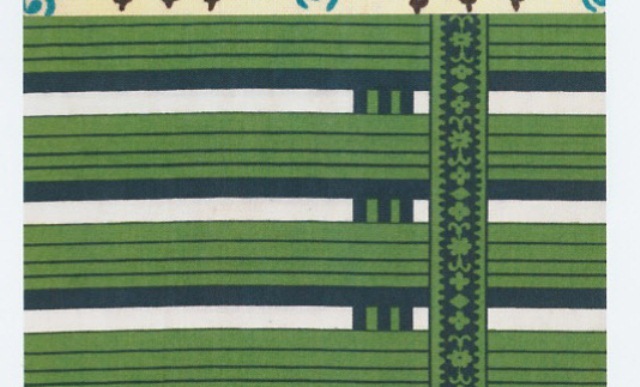 You know how I love design happenstance, so how could I not write a post on such a charming print? Nicky Haslam's version is Shutter Stripe. Colors include Dovecote Grey, Moonlight Beige, Pomegranate Red, New Mown Green, Cloudy Lilac, and Unearthly Brown. For more information on Shutter Stripe, visit NH Design's website. Here, Fowler used the fabric for shades in the home of Anthony Ayscought at 14 Gayfere Street, Westminster. Don't you love how you can see the sheen of the glazed cotton? 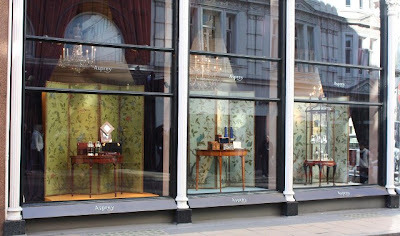 Venetian Blind also made an appearance as, what else, blinds in Fowler's early showroom at 292 Kings Road. 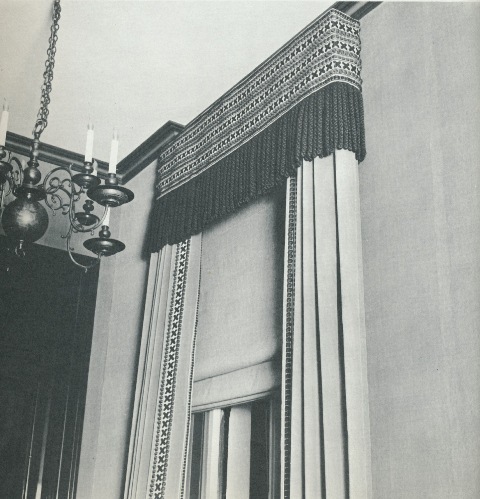 Here, the chintz was made into a roller shade at Yarty, a country home decorated by Fowler. I wonder if this vignette was located in Castaing's Rue Bonaparte showroom? I'd love to know what this wallpaper's print actually is. Might it be Venetian blinds? This Nobilis paper named "Les Jalousies" graced the entryway of the apartment of M. et Mme Yves Halard. 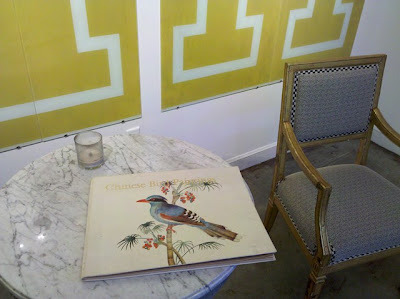 I visited the studio of my friend Ray Goins last Friday, and I found another book to add to my library. It's a 1967 work titled "Chinese Bird Paintings- Bird Paintings of the Ch'ien Lung Period, 1736-1796" with text written by J. Longridge. Ray had his copy so nicely displayed (see above) that I couldn't help but want one for myself. 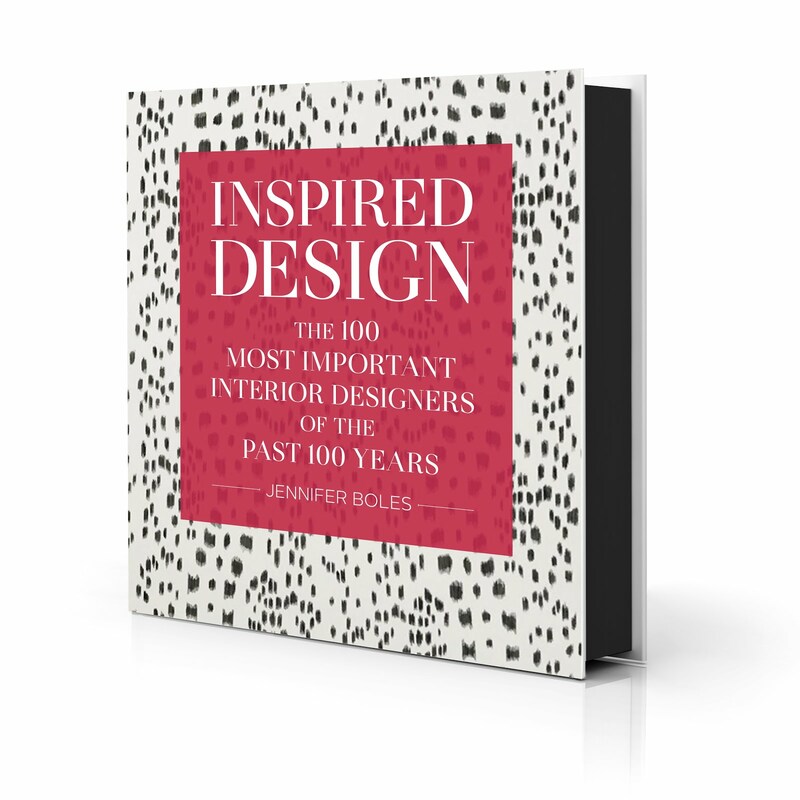 I had a heck of a time tracking down a copy of the book, but I finally managed to locate one in England, and as I write this post, it's in the hands of Royal Mail. 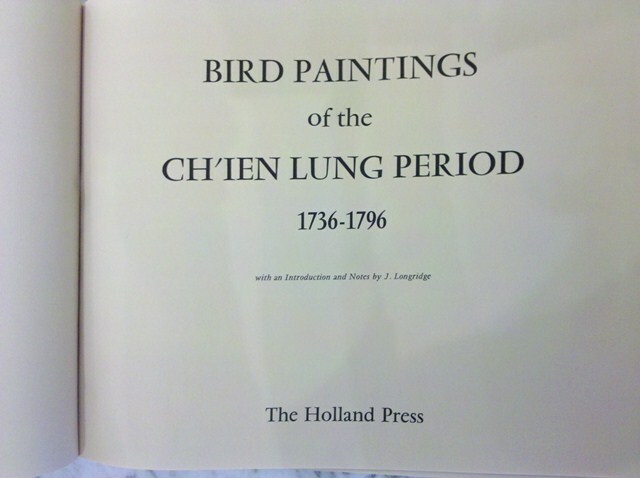 The book is truly beautiful as it contains color plates of various painted birds including a Green Magpie and an Eclectus Parrot. And on a superficial note, the cover is also really striking, making it a nice addition to the stacks of books on my cocktail table. 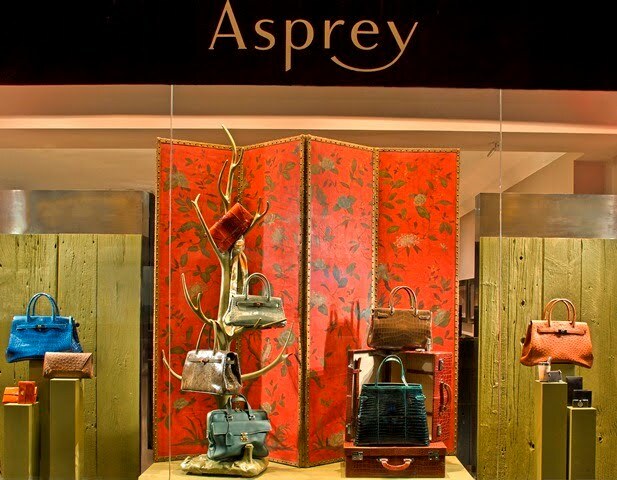 The book also made me think of Ray's glorious hand painted screens that he did recently for the windows of Asprey. His work was featured last fall in both the New York and London stores. Each screen was a different color (green, gold, blue, red, etc.) and featured the tree of life motif replete with birds. 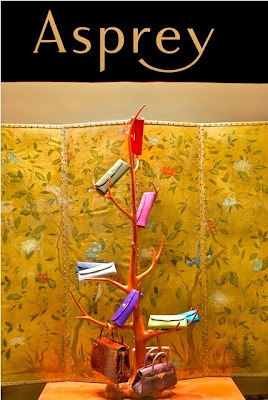 Ray continued the tree theme by creating colorful miniature trees on which accessories were displayed. 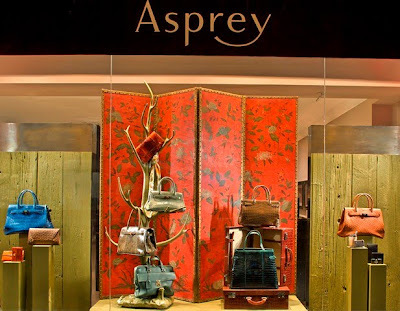 I certainly would not mind having one of these screens in my home...and perhaps one of those Asprey handbags as well. All images courtesy of Raymond Goins. I'm having an awfully hard time getting back into the swing of things. I was down at DCOTA on Tuesday for an Elle Decor panel discussion on blogging, and I think that the very brief taste of 80 degree weather has gotten me discombobulated, especially since the meteorologists are telling us that Atlanta may get, yes, more ice next week. Still, it was well worth the trip down to Ft. Lauderdale as I got to meet a lot of great designers and design devotees and see an absolutely beautiful design center. 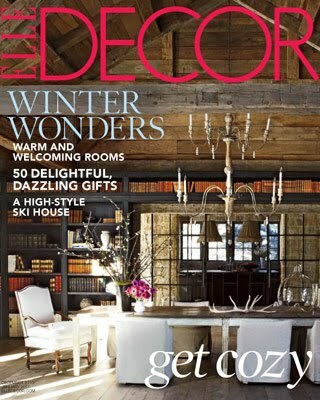 And, we got a sneak peek of Elle Decor's February/March cover (that's the Dec/Jan cover above.) I can't say too much about it, but when you get your copy, try to guess whose work is on the cover. It will be a very nice surprise to many of you; I know that it was for me. So, while I get my thoughts sorted out in hopes of formulating a proper post tomorrow, I thought I'd share a photo with you that put me in a very good mood (along with the trip to Ft. Lauderdale, of course.) It's a photo from Porthault's Facebook page. Is Spring around the corner? 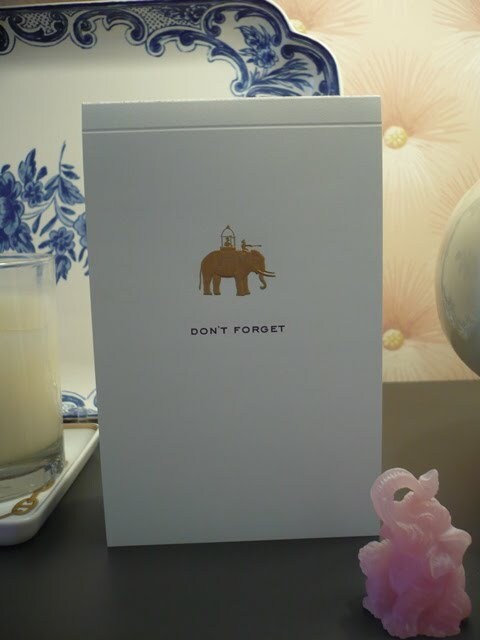 It dawned on me over the holidays that I'm partial to stationery, cocktail napkins, and other "stuff" that have quotations or phrases emblazoned on them. It might be a gentle reminder to "Don't Forget", or perhaps something cheeky like "We Don't Care How You Do It Up North!" (The latter was printed on paper cocktail napkins that I once had.) I've always admired the needlepoint pillows with witty sayings on them that Mario Buatta seems to be able to find. (Where, oh where, do you find these, Mario?) And then there is the needlepoint pillow that a disgruntled girlfriend once gave to famed Hollywood producer Robert Evans that read "He knows where you've been sleeping." That took guts, no? 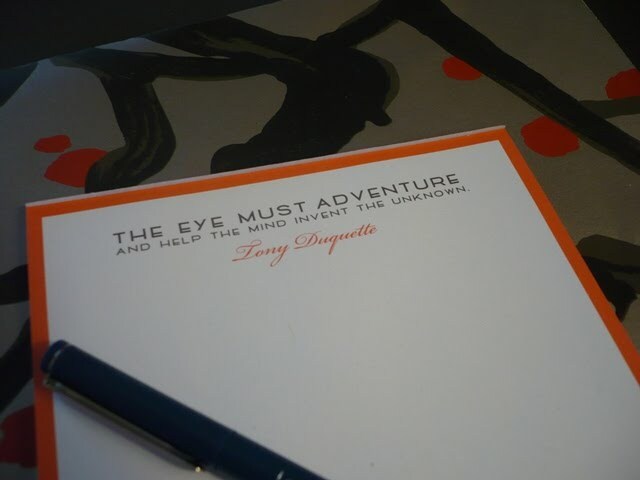 I decided to take a quick tour around my home and snap some photos of the notepads, napkins, and matchbooks which feature quotes. And no, no "He knows where you've been sleeping" pillows around here. My friend Louise seems to be a fan of quotations too. She owns monkey notecards printed with this quote by Edna Woolman Chase- " Fashion can be bought. 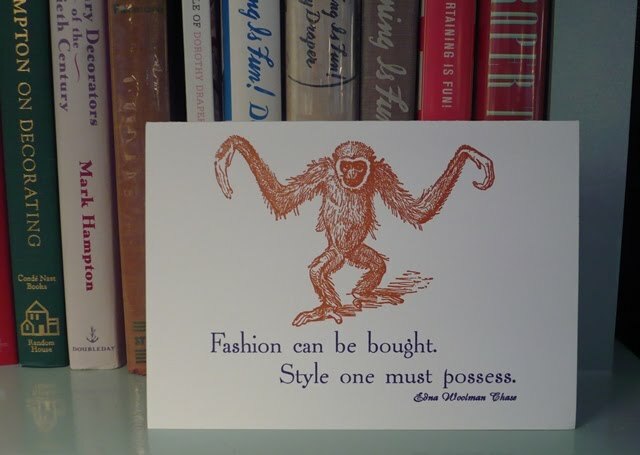 Style one must possess." Chase certainly had a point. Louise was kind enough to give me one which I display on my bookshelves. 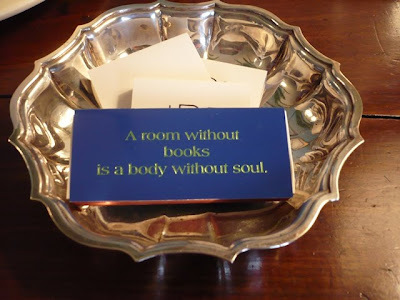 Another gift from Louise were these matchbooks with the immortal words of Cicero (the quotation had to be shortened because of the size of the matchbook)- "A room without books is a body without soul." Truer words were never spoken. 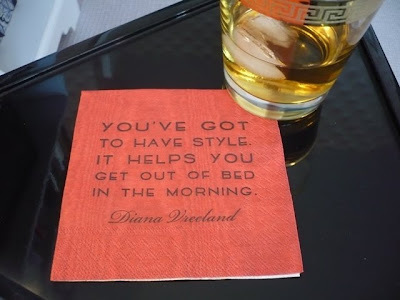 Didn't we all go crazy for Charlotte Moss' fabulous notepads and cocktail napkins that celebrated the spirited words of Diana Vreeland, Tony Duquette, and other style icons? I would argue that it takes a cup of strong coffee to get out of bed in the mornings, but what do I know. Why argue with Diana? 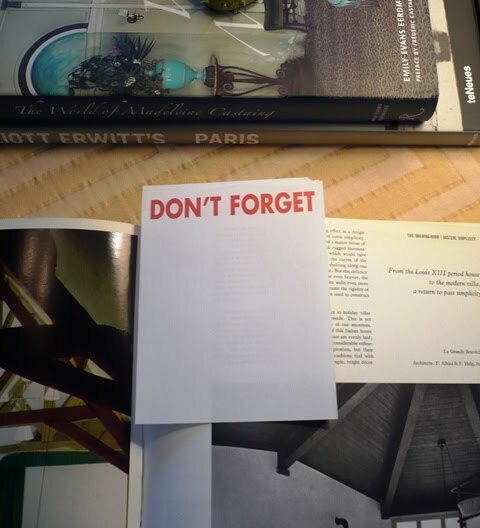 Yes, an actual piece of paper from Albert Hadley's famous "Don't Forget" notepads. To me, this is the equivalent of owning a vial of Elvis' sweat. It was stuck in a copy of "Decoration" that was once part of the Parish-Hadley library. I found it late one night around midnight, and I was positively dying to call somebody, anybody. How many people, though, want to receive a call in the middle of the night saying "Oh my Lord, I just found some of that Albert Hadley "Don't Forget" notepaper!" 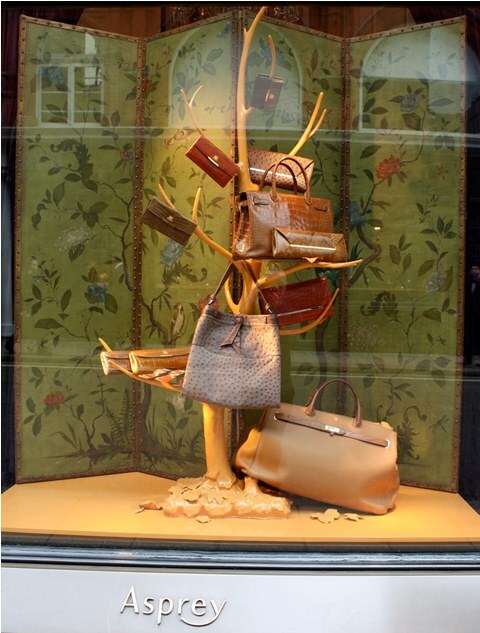 All photos taken by Jennifer Boles, copyright The Peak of Chic. Here's mud in your eye. I've been giving a lot of thought to house cocktails lately. A few months ago, House Beautiful asked me to come up with a cocktail that would be fitting to serve at one's mountain house. The first thing that popped into my head was "Southern Cola", a cocktail for which I absolutely cannot take credit. The creator of this libation was mixologist extraordinaire Greg Best of Holeman & Finch in Atlanta. The drink, by the way, is made of Coca Cola, Amaro, and a lime juice ice cube, and it's really quite delicious. More recently, my neighbors David and Scott served me a variation on the Satsuma Mojito, a drink favored by Julia Reed. David's version- he calls it the Satsuma Stinger- consists of Satsuma juice, soda, vodka, and mint. It was refreshing and fizzy and yes, it's so good that before you know it, it's 1am and you're stung. This needs to become David and Scott's house cocktail. All of this talk about cocktails led me to the decision that I need to come up with a house cocktail to serve my guests over the coming months. 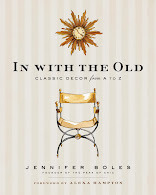 This actually is of vital importance to me as I live in a building where all we seem to do is eat a lot, drink a lot, and stay up well into the night discussing important matters like gossip, old Atlanta, and decorating. Hey, why not when all you have to do to get home is simply get on the elevator and press a button-hopefully the correct one to your floor. I do already serve Kir Royales from time to time, so this could be an option. It's classic, something that I like. 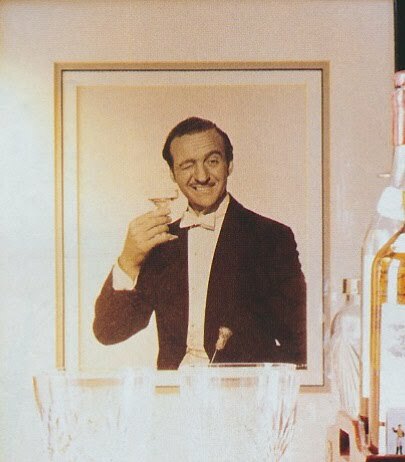 In fact, I believe that the first time I had one was at The Carlyle when I was college-aged, so this drink just might be the sentimental favorite for me. Of course, I could channel Nan Kempner and start proffering Bull Shots to my guests. Don't we all remember that W article in which Nan downed her Bull Shot, claimed she was "pissed drunk", and then proceeded to say that she "loathed fat people"? 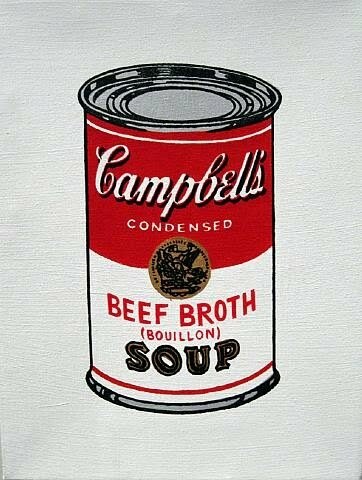 Do you think Bull Shots make you fat? Maybe I need a house cocktail that contains Bourbon because after all, I'm a Southerner. If you could bottle Sid Mashburn's classic and cool, traditional yet hip Southern vibe and mix it with bourbon, then that just might be the perfect Southern cocktail. If all else fails, I could serve what I oftentimes do: Riondo Pink Prosecco. 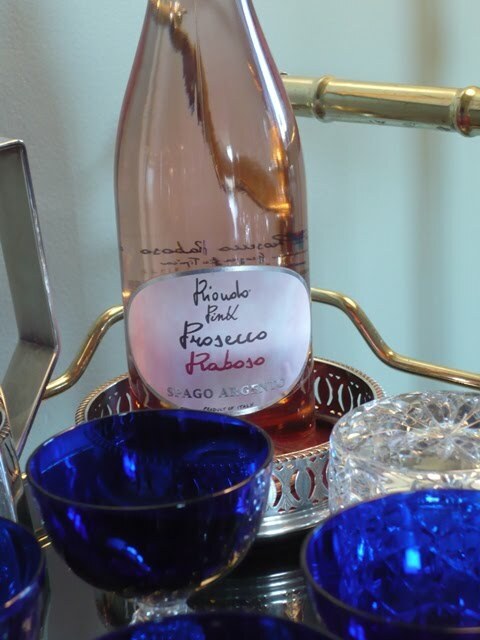 The taste is crisp and dry, the hue a rosy shade of pink, and the bottle's label is chic. What's not to like? But it's a new year, and it's time I venture out of my cocktail comfort zone and serve something different. I need help! You're a fun-loving group of people. What do you think? Top image from House Beautiful, Fernando Bengoechea photographer; champagne photo from Glorious Food by Christopher Idone; Campbell's Beef Broth silkscreen by Richard Pettibone; julep cup photo from Park Avenue Potluck Celebrations: Entertaining at Home with New York's Savviest Hostesses ; prosecco photo by Jennifer Boles.